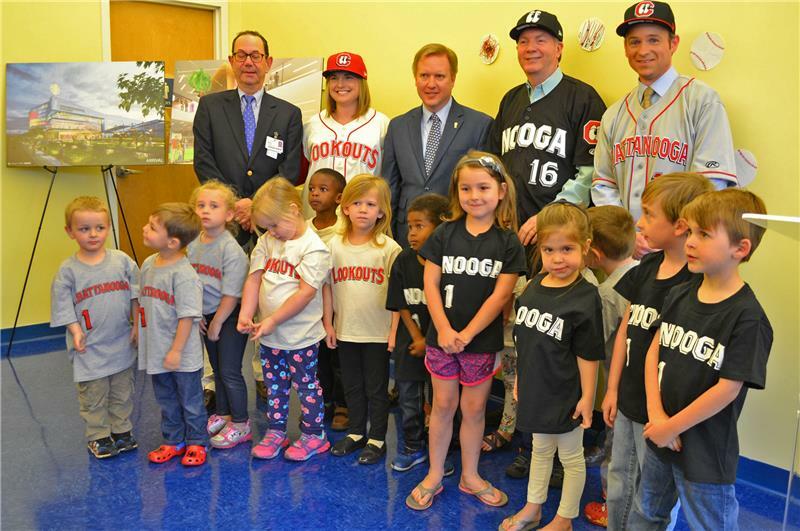 The Chattanooga Lookouts today unveiled updated marks and new jerseys for the 2016 season at a press conference at Erlanger’s e-Kids Learning Center. The team will wear their new home uniforms for the first time on Tuesday, April 12 at 6:15 p.m. The Lookouts introduced all three uniforms the team will wear during the upcoming season. The home jersey is antique white with red sleeves and red piping with “Lookouts” adorned on the chest. The road jersey features the “Chattanooga” wordmark across the chest in red on a grey jersey. For batting practice, the team will wear a red jersey with the “eyes” logo on the left chest. The team also announced a brand new alternate jersey that the team will wear for Thursday Home Games this season. The alternate uniform is all black with “Nooga” written in white on the front. The Lookouts will wear red belts and socks with each uniform. The uniforms were modeled by local news anchors, David Carroll from WRCB, Latricia Thomas from WTVC and Joe Legge from WDEF. Each anchor was joined by kids from the Erlanger’s e-Kids Learning Center. Along with the new uniforms, the team also revealed updated marks. The team’s new primary mark still features the iconic eyes logo with a new script underneath it but the logo has been tweaked to add depth. An alternate mark utilizing only the “Lookout eyes” was also introduced. The eyes will be seen on the team’s black hats that will be worn on Thirsty Thursdaystm with the team’s Nooga Jerseys. The new uniforms and updated marks were designed by Sky Design of Atlanta. Sky Design also designed the marks and uniforms for the Lookouts’ sister teams, the Fort Wayne TinCaps and Columbia Fireflies. The Lookouts 2016 season, presented by FSG Bank, begins on the road in Biloxi on April 7. The team makes their 2016 home debut on April 12 when they face off against the Jackson Generals at 6:15 p.m. at AT&T Field. Single game tickets for the upcoming season are now on sale on line and over the phone. For more information on how to secure your seats to the season’s best games, call the Lookouts ticket office at 423-267-4TIX.